Good Homogenizing / Blending result are achieved by this type of reclaimer as every thin layers of material are cut-off from the entire cross section of the stockpile by reciprocating harrows. The reclaiming capacity is constant and easily adjustable by varying the operational speed of travel drive with help of VVVF Panel. 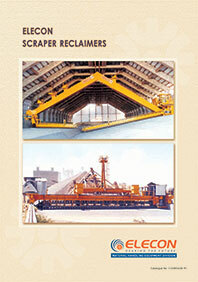 This type of scraper reclaimer is provided with two harrows to dislodge the material from front face of stockpile. Scraper blade fitted on scraper chain collect the dislodged material & feed it to reclaim yard conveyor. It is most suitable for reclaiming the material having large lumps and abrasive nature. Mainly used, Where Blending of Material Required. Suitable for Larger lump size. Scraper blades fitted on chain at regular interval carry the reclaim material and feeds it in to Belt conveyor. Harrows are used to dislodge material from front face of Stockpile. Max. Installed Reclaim capacity of machine is 1600 MTPH. Maximum Rail Centre Of machine is 42.35 meter. 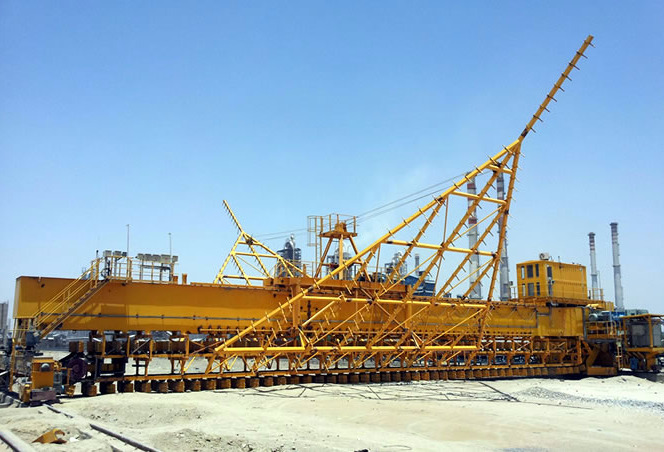 Total number of Bridge Reclaimer Machine supplied is 47 nos.